Place whole (thawed) chicken breasts on top and cover. Note: this makes a lot and it is even better the next day for lunch! 2705 members have added this recipe to their cookbook. I am going to try this one! Sunds so yummy! I made my own taco seasoning mix with Hatch chili powder, Emeril's Southwest Essence, cocoa powder, cumin, Mexican oregano. Followed the rest of the recipe exactly. Topped with plain non-fat yogurt and a sprinkling of cheese. Super good!! I made this recipe for dinner tonight and it is very filling and delicious. How much is a serving? 1/2 cup? 1 cup? It is delicious! Even my picky eater asked mfto mge it again! 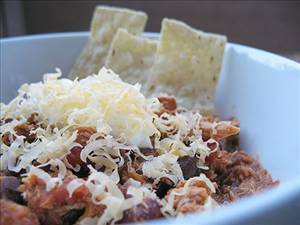 There are 199 calories in 1 serving of Crockpot Chicken Chili. Calorie break-down: 7% fat, 48% carbs, 45% protein.